Every once in a while I’ll buy a new travel mug but so far none of them have managed to keep my coffee hot for more than 15 to 30 minutes. 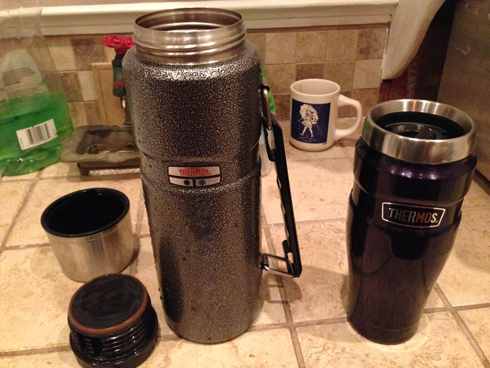 These days I brew up a pot of coffee each weekday morning and then pour it into a Thermos brand thermos. It does a great job of keeping coffee hot through most of the day but once a cup is poured out it would cool rather quickly. Last week I ordered a Thermos brand travel mug (Thermos Stainless King 16-Ounce Leak-Proof Travel Mug) and it is exactly what I’ve been looking for. I can fill the mug in the morning and whatever I haven’t drank will still be hot near lunchtime. Some may not be too keen on spending $20 for a travel mug but it’s easily worth the cost. It does such a good job of keeping the coffee hot that I waste less and may even begin brewing up just half a pot in the mornings.